Loud sounds until 22.00, after 22.00 party can be continued with quiet manner. Providing affordable accommodation without compromising excellence, Hostel Capitan Tom is the best choice while enjoying the beauty of Antigua. Make your way to this cozy hostel now. 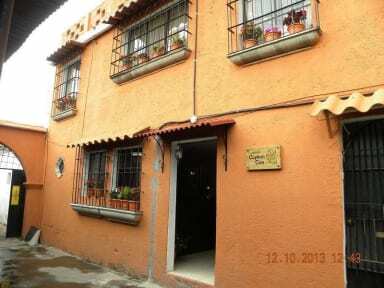 Hostel Capitan Tom offers 5 spacious,private and Shared Rooms and very nice terrace. Two private rooms and one dorm for 6 person with volcano view, and two dorm for 4 and 6 person with out view, each one featuring comfortable new beds with fresh linens. All rooms are on the second floor of our building. Full equipment kitchen, laundry,security boxes,cable television, and free WiFi. All guests have access to the rooftop terrace with panoramic views of the city and volcanoes. Our gates close at 8 pm. After 8 pm please call us by phone. 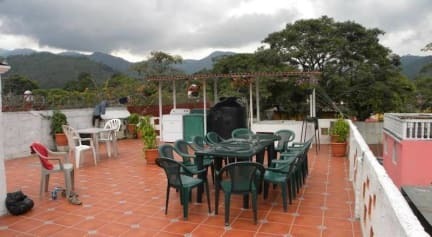 A well-located hostel with a beautiful terrace, free drinking water and coffee. The owners went out of their way to look after me. They help to organise transport and tours too. We had a pleasant stay in this cute and comfy hostel, it felt like a home away from home. Great facilities with a very well stocked kitchen. The staff were lovely and helpful. Be sure you like dogs, there's 3 of them! The owner is amazing. This hostel doesn't have all the trendy 'bells and whistles' but has the perfect terrace view of the Fuego volcano. When we were there the volcano erupted all night (~every 20min) and let's not forget about the gorgeous sunrise. Highly recommended. Overall great, the Russian family who owns the hostel has 3 dogs, so you have to enjoy dogs. They allow you to use kitchen and their items. They are a nice family, next to the market and chicken bus terminal. I Would return. My boyfriend and I stayed one night in the 4 dorm. The room was small, I would choose the 6 person dorm next time. Staff were very nice and helpful, the bathrooms clean and we almost didn't notice the dogs (huskys). The location and value for money is really good! Thank you for the stay. Very clean and in a good location. However, it's more of a house than a hostel, the owner sleeps on a bed behind the reception desk. The younger guy who works there walked into our dorm multiple times and when I asked him to leave he was unpleasant. Hostel is very cheap so I guess expectations should be low. The hostel is very dirty and although their dogs are beautiful the entire place smells. There was someone sleeping on the roof in a tent and also someone who slept on the couch so the common spaces were not really usable. We were glad to only stay 1 night and did not even risk the shower. Overall, staff were friendly and place was cheap so if you don't mind being dirty then this would be fine. Do yourself a favour and avoid this place. The only good thing I can say about it was the lady behind the front desk was exceptionally nice and helpful. The other worker there Vlad is constantly confrontational and loud, which is unbearable and woke me up most morning's. There's two bathrooms for 30 people which leads to a 3 year wait for a pee or shower. The place itself is not very clean either. The WiFi is temperamental and has a speed of a snail with a broken leg.